What Do I Wear For My Engagement Session? This is the #1 question I get once people book with us. And I definitely understand why. I still ask myself what the heck am I going to wear every year for our annual family photos we get done. It can be stressful figuring out the perfect outfit for a photo shoot. You want to look your best for these photos. They will likely go on your save the dates or maybe theyre the first professional photos you’ve ever taken with your future spouse. I decided since I get asked so often about how to plan for an engagement session, I will give tips here so you have at the very least a starting point with planning your engagement session. As for hair, some of our clients choose to get their hair professionally done. Sometimes a simple blow out can make a huge difference. Some people even just do their own. I definitely suggest a style of some kind, though, even if you do it yourself. When we plan an engagement session, the look is key. Some people want a cityscape, some people want tall grass in a field, and some people enjoy the look of a simple town square. We have done engagement sessions everywhere from a fire station for clients who worked for Fire and EMS to a golf course for clients who were avid golfers, to an art gallery. Your looks will depend on where we plan to shoot your session. I always suggest a classy look and a more casual look. Some people will even choose to do some photos in a sports jerseys if they have teams they love, or shirts from where they went to college. For the golf course session I mentioned above, the couple dressed in golf gear for the photos we did on the course. Then we did a dressy look up at the clubhouse. It’s important to be yourself, but also use this as a time to dress up! One of my all-time favorite looks is a gown and suit for an engagement session. Of course, this look works best for a city-scape or indoor session, but each time our clients do this look they end up looking like super-models in their photos! 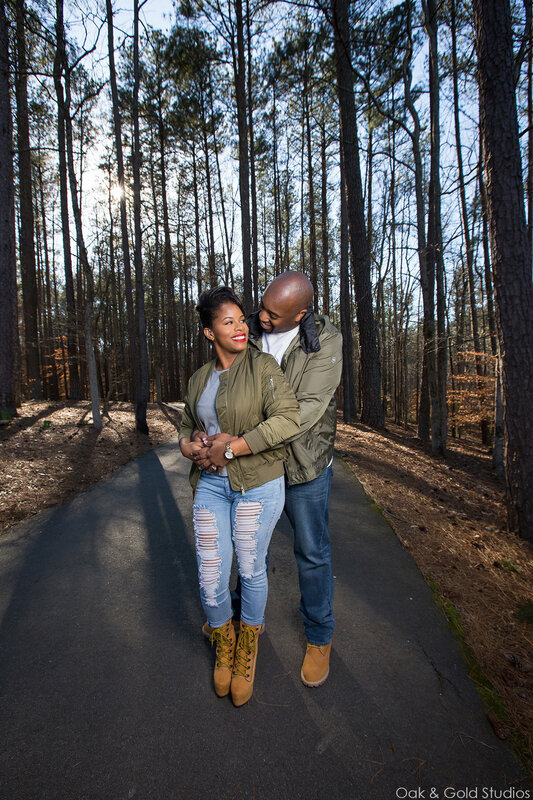 I love it when our clients have more than one outfit for their engagement session. We don’t put a limit on how many outfits our clients may have for their session, but usually 2-3 is perfect. Anything more than that and it becomes like a fashion show and those are tiring! Two to three looks will provide a nice variety in your photos and you can do the dressy and casual looks I mentioned above. For a dressy look I mentioned a gown and suit. Of course this isn’t necessary, but it’s a wonderful option for those willing. Imagine romantic photos, an evening on the town. It can be so fun to dress up like this for a photo shoot. Even if that is a bit much for you, a nice dress and dress pants and a dress shirt works well for this look. For the more casual look, jeans work well. For the women, heels or boots and a blouse look nice. If you are doing a field or park session, platform sandals work well. Other options besides jeans are capris or a skirt. For the men, jeans or khakis and button down shirt look nice. Some men choose to pair this with a blazer. For the colder months, sweaters look nice with jeans or khakis for both parties. The only thing we won’t suggest are sneakers or tennis shoes unless they are specifically for a sports-themed look. Colors can vary. Some photographers will recommend not wearing certain prints or even all black. We think almost anything can work well for photos if done right. The only thing we don’t suggest is both of you wearing the exact same color. For example if you both wore all black, you may blend into one another. Other than that prints and certain colors won’t ruin your photos. There are some colors that go better together than others. When I was in art school we focused a lot on complementary colors. Plum and gold (purple and yellow), for example, go well together. As do navy and rust (blue and orange). Monotone colors also go well, which include different shades of a certain color, plus whites and blacks. In conclusion, you should feel comfortable with what you’re wearing during your engagement session. But also this is a great time to step out of your normal, everyday outfits into something fancy and fun.